Published: June 7, 2012 at 04:00 p.m.
Chad Ochocinco's career with the Patriots ended just as strangely and abruptly as it started. NFL Network's Albert Breer confirmed Thursday, via a source with knowledge of the situation, that the Patriots released Ochocinco after trying to trade him throughout the day. 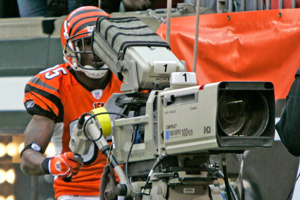 ESPN first reported Ochocinco's release. The team later confirmed the move in a release. Earlier Thursday, a report emerged that Ochocinco left the Patriots' facility suddenly. It was later reported that he had an "eye appointment." Ochocinco's next appointment likely will be to the airport to visit another team. This isn't a situation like Terrell Owens or even Randy Moss. As the Boston Globe pointed out Thursday, Ochocinco reportedly looked "very fast" and was in good shape physically at Patriots practices this offseason. He just never could pick up the offense. He caught only 15 passes last year, good for sixth on the team. The Patriots system requires wideouts to make split decisions based on the defense in front of them. It requires them to be on the same page as Tom Brady. Ochocinco seemingly never could figure it out. He often lined up in the wrong place, a problem that extended into this offseason. With plenty of wideouts now on the Patriots' roster, it was going to be an uphill battle for Ochocinco to make the team. We don't know what made the Patriots release him now, but they probably did him a favor. He now has time to latch on with another team. Meanwhile, the Patriots machine will roll on with guys like Jabar Gaffney and Deion Branch. They might not have the star power or even the speed that Ochocinco has, but they know what Tom Brady is thinking when he drops back to pass. Ochocinco could never figure it out. UPDATE: Ochocinco wrote on Twitter: "Thoroughly enjoyed the oppurtunity to play for the "Patriot" organization... fans were wicked awesome, I wish all of you the best..."